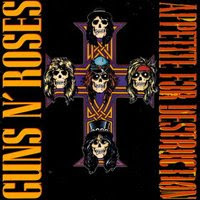 I listen to Appetite for Destruction about once a year, always with headphones on, and always from start to finish. Sometimes it's when the mood strikes me; sometimes something will set me off. Last year it was because I was reading a lot of Chuck Klosterman. This year I'll probably see some news about Steven Adler going to prison. Then, boom! I'm into it. There's really no point in dissecting Guns N' Roses, so I won't do it. But this is easily the best "hard rock" album that came out of the 80's, and it really is a pleasure to listen to. Tracks like "Nightrain" and "Out Ta Get Me" must have made Nikki Sixx want to curl up in a ball and cry. And I'm all for that.